A 150W post-top/garden light with 5700K color temperature is available as: light weight; in slim and sleek design; in metal; & in bronze color. The product provides for high lumen output of 19,225 lumens, long lifespan and high energy efficiency. 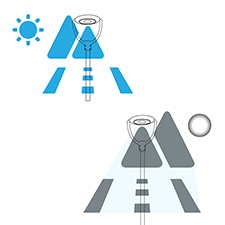 A beam angle of 90 degree (Type III) and a CRI of >80 provides for an intense bright light that provides for adequate illumination & safety during the night hours. Housing is constructed of rugged aluminium for excellent heat dissipation. The product has an internal IP65 driver making it dust and moisture resistant to be conveniently installed in locations with harsh weather conditions. 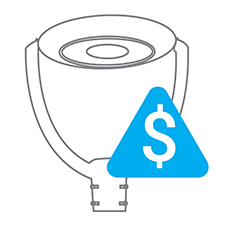 A UL, DLC, CE and RoHS certified, the luminaire is eco-friendly and mercury-free. This 150W LED post-top light can easily replace 400W of a metal-halide fixture, saving almost 75% on your energy bills. 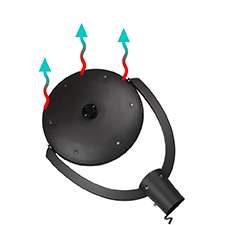 Thermal Heat dissipation: Through a massive heat sink made of aluminium, the fixture can operate safely and securely at any point in time and because of which it also has a longer life expectancy. 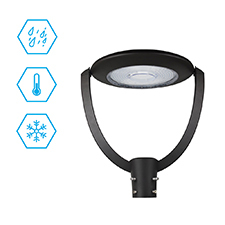 An IP65 Rating For Water-resistance: The outdoor LED post-top/garden lights come with an IP rating of 65 which means they are protected from complete ingress of dust and low-pressure water jets coming from any direction. 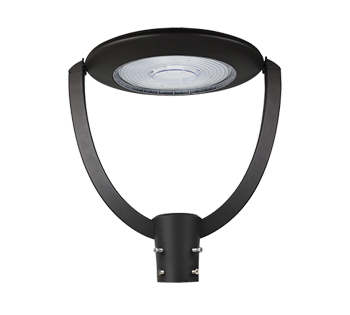 Metal Exterior: Our LED post-top light has adequate durability and luminaire protection. The metal used for housing our LED post-top light is a rugged, die-cast and soft square aluminum so that the luminaire acquires an extremely solid build to remain protected from any external damage. Lumen Output (19,225 Lumens):A lumen output of 19,225 lumens means -- our 150W LED post-top light has a more than standard energy-conversion efficiency when no energy consumed is wasted in the form of heat thus making it a superior product over any conventional metal-halide lamps. 5700K Color Temperature:Our LED post-top lights reward you handsomely when it comes to correlated color temperature. With this 150W LED post-top light, you can have a day white light most suitable to facilities/spaces requiring detail and focus. This color temperature is also good for security lighting in any outdoor space. 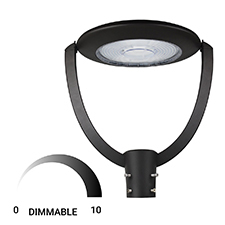 A CRI of 80+: A CRI of 80+ further ensures that you can see the objects under this lighting fixture with more than 80% precision in comparison to a referent light source. Safe Lighting:This 100W post-top/garden light is free from any harmful radiation such as UV or IR and therefore safe for human body. An environmental-friendly luminaire:This LED post-top light being free from any toxic chemicals such as mercury or lead lets us save the environment in the best possible way. Warranty: You have 5 Years of warranty on this product from the manufacturer’s end. The installation of our LED post-top/garden light comes easy and you can undertake in few easy steps. All you will need during the installation process is -- a transformer, a cable, wire strippers, a tape to hide the cables, a shovel, q screw driver and the lamp. You must read the manufacturer’s instructions in detail before you begin to install the LED post-top light. Our LED post-top/garden light being IP65 rated is protected against dust and moisture (or water from a nozzle), making the lighting fixture suitable to damp locations. 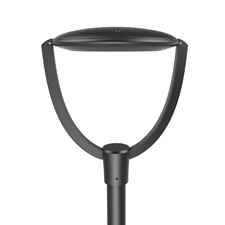 The LED post-top light/garden light is housed in a rugged, die-cast aluminium for durability and protection from external stress or strain, rust or corrosion. Through a big heat sink made of aluminium, our LED post-top/garden light is able to dissipate any heat that may be produced by the luminare, thus providing you with a consistent lighting for the time-period that it is operating. The beam angle being 90 degrees for our LED post-top/garden light ensures light beam to spread over larger areas and wide spaces for uniform and even lighting, and for general area lighting than having any accent lighting. 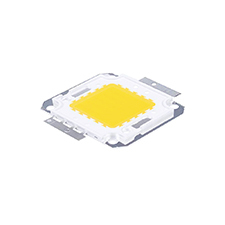 Our LED chips are of premium grade having been manufactured by Epistar Corp. -- the largest manufacturer of LEDs. Through such a premium LED chip, our products have acquired high operational efficiency. Our LED post-top/garden light can be dimmed down from 0-10V so as to bring in extra energy-savings, when too much amount of light is not needed during the downtime. The LED post-top light having a high CRI enables objects and spaces to reflect their true colors up to 80% precision when compared with a natural light source. 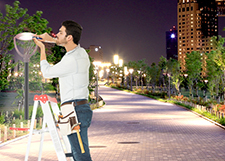 Our LED post-top/garden light lasting for 50,000 hours doesn’t require any maintenance until the end of its service life because of its high operational efficiency achieved due to LED chip embedded inside it. Thus, you can maintain the light at a minimum cost. 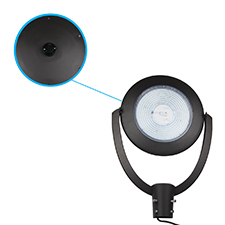 Our LED post-top/garden light comes with an inbuilt photocell or dusk to daw sensor, when the primary role of any photocell sensor is to get turned OFF after detecting an ambient light while getting turned ON during darkness. 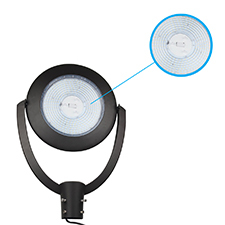 That is why this post-top/garden light is known as dusk to dawn sensor light. Our LED post-top/garden light has extensively been tested for vibration to check if there is any structural damage or loose component etc. 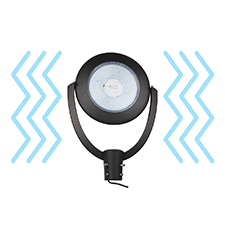 We make sure for all our luminaires that there is complete resisance to external vibration in any form. 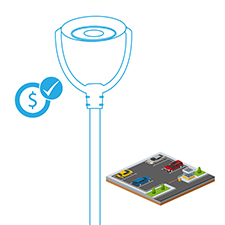 Our LED post-top/garden lighting fixture has the DLC approval and so comes under the scope of rebate-eligibility norm, thus allowing you to have rebates, if you are found eligible.